As of 2018, a military member assigned to or deployed to a combat zone receives bonus combat pay (officially called "hostile fire" or "imminent danger pay"), at a rate of $225 per month. It is in addition to their regular pay rate. Being assigned to or working in a combat zone also triggers a tax advantage in some locations. Congress and/or the president can designate combat zones as "Tax Exempt" areas. Earnings received while in these combat zones are not subject to federal tax withholding. This exclusion is unlimited for enlisted members and is limited to the maximum enlisted pay amount for officers and warrant officers. If you spend a single qualifying day in the combat zone, your pay for the entire month is excluded from taxable income, and you receive $225 in combat pay for that month. Any other bonuses and special pay you receive will also be excluded from federal tax withholding if you earn them while in a combat zone. For example, a reenlistment bonus is excluded from taxes if the member reenlists in the same month in which the member also served in a combat zone. Since there is no limitation on amounts excluded for enlisted members, the entire reenlistment bonus would be excluded. As another example, an officer's flight pay would also be excluded from taxable income, but only up to the point which basic pay and the flight pay do not exceed the maximum enlisted pay amount. In addition to imminent danger pay and the tax exclusion, some areas qualify for a special monthly allowance called hardship duty pay. 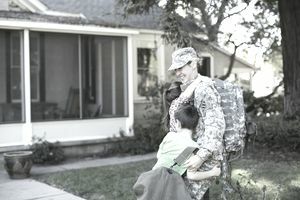 Military members with dependents also receive a Family Separation Allowance (FSA) of $250 per month any time they are away from their families due to military orders for 30 days or longer. Finally, members in a combat zone are authorized to deposit up to $10,000 (per year) of their pay and allowances into a special savings account that pays a guaranteed 10 percent interest per year. This program was established during the Vietnam era and then phased out at the end of the Vietnam War. However, it was revived in 1991 during the Gulf War, and the program still exists today. In addition to the combat zones listed below, personnel stationed in Kazakhstan and Turkmenistan are eligible to use the tax-free program if they are supporting combat operations in Afghanistan, even though they are not physically in Afghanistan. Here are the currently designated combat zones- for members of the U.S. military as of 2018. What Are the Basics of U.S. Military Jump or Parachute Duty Pay?